Where should Millennials looking to buy a home move to? RealtyHop, a startup sale and rental listings portal that attempts to predict what a property will rent for, crunched U.S. Census data and figured out the best metropolitan areas for millennials. And the results are fairly surprising: famed destination cities NYC and Los Angeles did not fare well in the analysis. The number one city for millennials today is the metropolitan area connecting Omaha, Nebraska and Council Bluffs, Iowa. The next top two cities on the ranking are Des Moines, Iowa and Pittsburgh, Pennsylvania. “When it comes time to pick a place to live, there’s an astounding amount of both cultural and social pressure to simply move to where everyone else is – as a result of this, many people move to coastal cities like New York or Los Angeles because it’s ‘the thing to do,’” wrote RealtyHop. Instead it presented a more evidence-based approach to picking cities to move to as a millennial. The top choice, the Omaha-Council Bluffs metro area, came in with a median home value of $170,200 and median household income of $71,151. What seemed to set it apart was the 7.1 percent of residents who are either international or moved there from out of state. On the other hand, New York City (combined with Newark, NJ) ranked number 237 overall with a median home value of $440,900 and only a median income of $83,410. The Los Angeles-Long Beach-Anaheim area had a median home value of $617,100 and just a $72,654 median home income. While they ranked highly for other aspects of living in a city, they were brought down by the extremely high home value-to-income ratios. Though that does not appear to dampen any enthusiasm for moving to these urban centers. And these big cities certainly weren’t the worst places for millennials to live. That dubious honor went to the California metros of Madera and Stockton-Lodi, Again, RealtyHop blamed their last place rankings due to the low median income stats and very high housing costs. Yakima, Washington had a similar home value/income ratio, as well as low rankings in the other categories. “When it comes to deciding where to move to, millennials should be sure to expand their horizons beyond the ever-popular coasts – there is a lot of value to be had by digging in one’s roots in other cities. 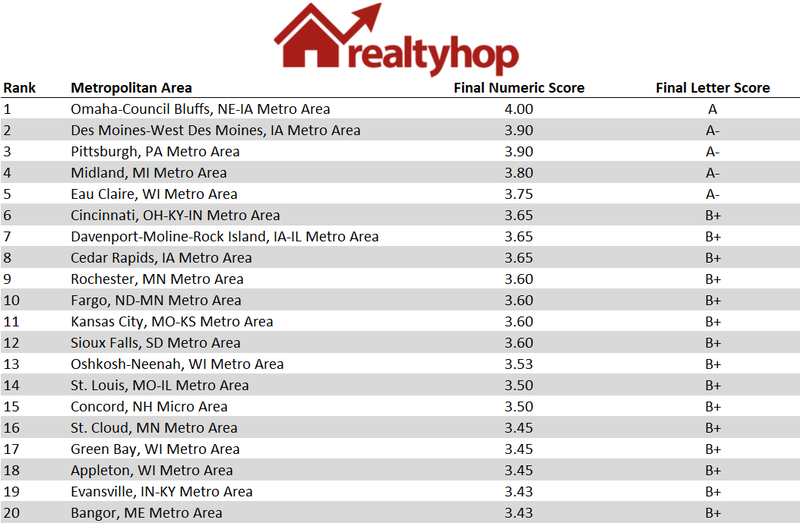 At the end of the day, however, there’s no comprehensive index that can determine the best metropolitan area for any given individual,” wrote RealtyHop.